We continue exploring the biggest conundrums in Earth sciences in this third post of the known unknowns. In the two previous instalments of the series we’ve discovered what the major questions still to be answered about the early days of planet Earth and its inner workings are. We now move onto the planet’s surface. The advent of plate tectonic theory, arguably one of the biggest advancements in the geosciences of the past century, has allowed us to far better understand how continents are built and the hazards associated with moving plates. Nevertheless, there is still much we do not comprehend, opening the door for hugely exciting and innovative research opportunities. How well do different approaches to establish plate motion compare? How does the long-term deformation derived from paleomagnetism and structural geology link quantitatively to the present-day motions derived from GPS and from neotectonic patterns of crustal deformation? (Calais et al., EPSL, 2003) How do these last two relate to each other? (Wang et al., Nature, 2012) Can we learn from regional structure of the crust/lithosphere from that link (or viceversa)? Are plate interiors moving in steady-state linear motion? How rigid are these and why/when did they deform? (Davis et al., Nature, 2005, and Wernicke & Davis, Seismological Research Letters, 2010). How is relative motion between continents accommodated in diffuse plate boundaries? 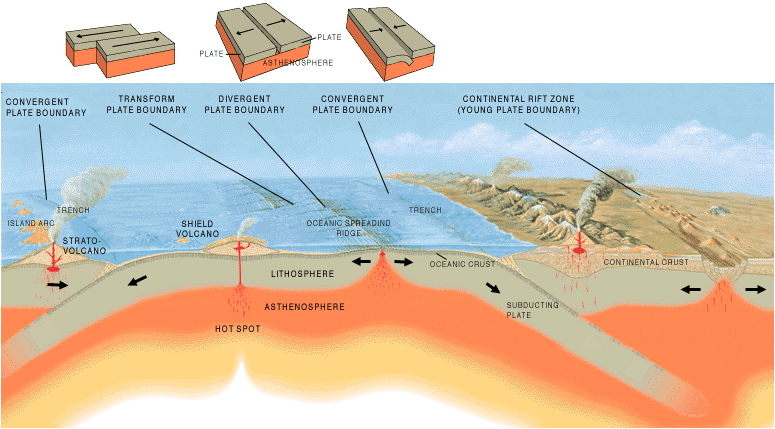 (eg., the Iberian/African plate boundary). What determines the (a)seismicity of a plate contact? What is the rheological stratification of the lithosphere: like a jelly sandwich? Or rather like a creme brulée? (Burov & Watts, GSA Today, 2006). Is the lower crust ductile? Is strength concentrated at the uppermost mantle? Or just the other way around? (e.g., McKenzie et al., 2000, JGR; Jackson, GSA Today, ; Handy & Brun, EPSL, 2004; and a nice blog post). 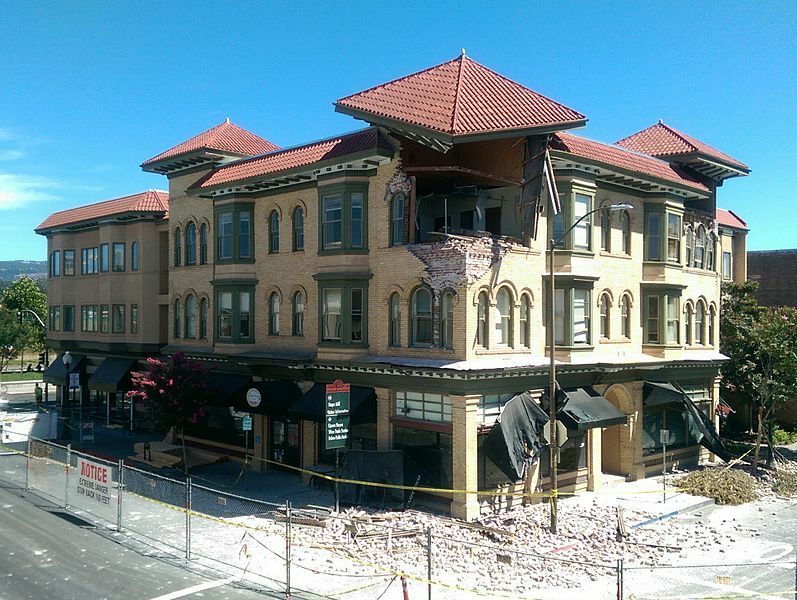 Earthquake damage to the Alexandia Square building in Napa, California (Image Source: Wikimedia Commons, Author: Jim Heaphy; User: Cullen328). Can earthquakes be predicted? (Heki, 2011, GRL; Freed, 2012, Nat.Geosc.). How far away can they be mechanically triggered? (Tibi et al., Nature, 2003). Little is known about how faults form and when do they reactivate, and even worse, there seems to be no clear pathway as to solve this problem in the near future. Unexpected breakthroughs needed. How can the prediction of volcanic eruptions be improved? What determines the rates of magma accumulation in the chamber and what mechanisms make magmas eruptible? See for example this article on the Yellowstone Caldera and this paper regarding volcanic uplift. How much of the Earth’s surface topography is dynamically sustained by the flow in the mantle? In many regions, the elevation of the continents does not match the predictions from the classical principle of isostasy for the Earth’s outer rigid layer (the lithosphere). This deviation is known as dynamic topography, by opposition to isostatic topography. But what are the mechanisms responsible? Can we learn about the mantle dynamics by estimating dynamic topography? (Braun, Nature Geoscience, 2010). Can the hidden loads needed to explain the accumulation of sediment next to orogens (foreland basins) be linked to these dynamic forces? (Busby & Azor, 2012). Have you been enjoying the series so far? Let us know what you think in the comments section below, particularly if you think we’ve missed any fundamental questions! In the second to last post in the series we will outline the top outstanding research questions with regards to the Earth’s surface: Earth’s landscape history and present environment.